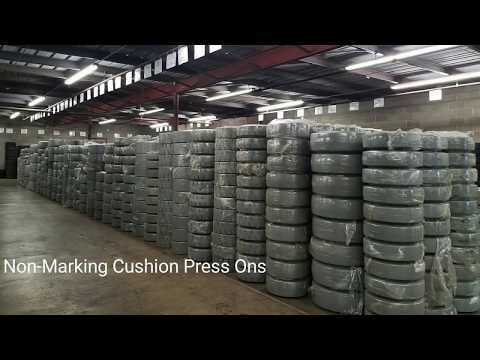 Grey Non-Marking Traction Skidsteer Tire & Wheel Assembly - Free Freight! Are you considering whether to purchase solid tires or foam filled? You may be wondering why the cost of solids are so much more. The reason is the long-lasting durability of the tire. With foam filled tires, you only get 3-5 years of life. With solid tires, you get the entire lifetime of the machine (and likely 2 machines). Solid tires ride as smooth as foam filled tires but last 3-5x longer. You will see dramatic lifetime savings on your tire expenses. This price is per-tire and wheel assembly but they are sold in sets of 4. Warranty: 1 year or 500 hours, whichever comes first. Minimum order is one set of 4 and they ship from McGregor TX. All products from Armadillo Tire are guaranteed to be free from defects due to workmanship and materials. The guarantee is valid, if tread lugs are available, and the Tread Wear Indicator (TWI), or 60J line, is still on the sidewall of the tire. The available warranty period is one year from the date of purchase or 500 hours from date of installation; whichever comes first. If the customer has a product failure, a warranty claim adjustment should be submitted according to the standard claim procedure. Upon examination, Armadillo Tire will approve, or deny the claim within one week. If our analysis shows a tire has failed under this guarantee, we will make an allowance against the purchase price towards the purchase of a new Armadillo Tire, relative to the unused portion of the tread on the defective tire. This guarantee is for the exclusive benefit of the owner, and this warranty is not assignable. Armadillo Tire does not warrant against consequential, or incidental damage, arising from defective tire. Exclusions: All Armadillo Tires are designed and manufactured to carry the loads at the appropriate speeds given in the ETRTO standards. Special attention should be paid to the footnotes regarding mounting, speeds, and usage. -Sizes of the tire and rim should correspond to each other. -The sizes of the rim should correspond to the ETRTO standards and tolerances, the type should be flat base or split wheel for solid resilient tires. -The rim and lock rings should be in good shape, without cracks, deformations, or excessive rust. Deformed or damaged parts should be replaced. -The rim load capacity should be equal to or exceed the tire load capacity. -All rings making up part of the rim should be used. 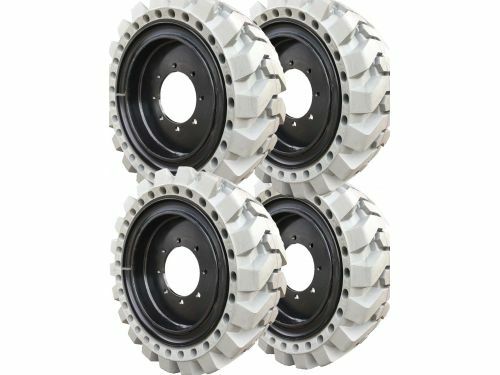 -Trained people using the right tooling should mount tires to the rim according to the Armadillo mounting recommendations. -The maximum speed of the vehicle should not exceed the ETRTO values. These speeds are given for the unloaded vehicle. 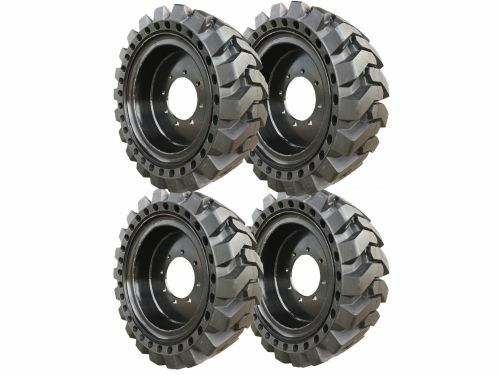 As industrial tires are designed for intermittent service only, and limited running distances. The continuous average speed should not exceed 3 mph at an average load of 75% of the maximum ETRTO load. This at an ambient temperature of 68°F for solid tires. For average loads, average speeds, and ambient temperatures exceeding the indicated values and for distances longer than 1.2 miles per journey, the application should be investigated in detail to check whether the tire working temperature remains within acceptable and safe limits. - Damage resulting from misuse, improper mounting, misapplication, use of non-approved rims, overloading, misalignment, defective brakes, abuse, willful damage, oil, chemical action, fire, or other externally generated heat, use of studs, water, or other material entrapped inside the tire, vehicle damage or road hazards (such as rock cuts, punctures, cut separations, impacts, flex breaks). - Irregular or tapered wear or rapid tread wear - Used, Repaired, or Retread tires. - Tires that have been modified in any way (regrooving, relugging, etc.) - Any costs associated with the repair of tires (unless previously approved by Armadillo Tire). - Costs of mounting following pro-rated replacement or repair of tires, applicable federal, state, provincial, and local taxes and transportation. - Cost of disposal of warranted tires (this is the responsibility of the customer) - Manipulation damage, poor storage, and improper unpacking Storage Armadillo Tires must be stored in a protected environment (a dark, dry place, out of the sunlight), as specified in the ETRTO recommendations. 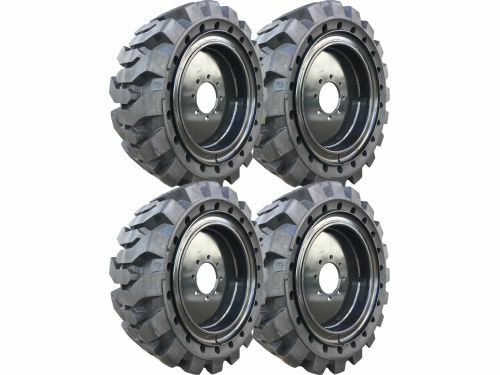 Black Traction Skidsteer Tire and Wheel Assembly - Free Freight!